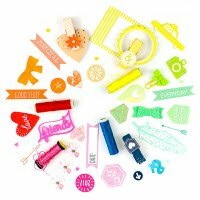 Hello and welcome to Altenew Crafty Friends Blog Hop here at my blog! 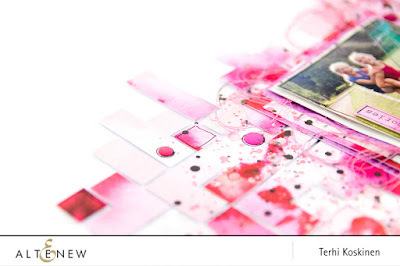 You probably found your way here from Cardmaking & Papercraft's blog. And if not, take a look to all of the blogs in the list below - so MANY giveaways, offers and tons of inspiration. I'm glad to be part of this. 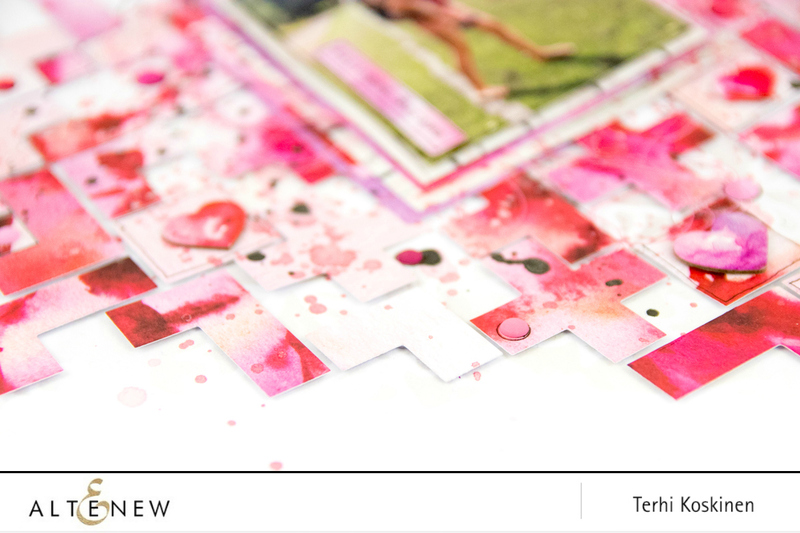 My layout is all about pinks and reds, made with Altenew Reflection Scrapbook collection. When I first thought about the idea of 'crafty friends', I thought about love as friends give and receive so much love from each other, right? And years ago, when I frist found scrapbooking, and all things around it, I soon discovered a whole new group of people supporting each other, helping and loving. Couldn't imagine my life without my Crafty Friends anymore. Thank you all my Friends out there, you are appriciated, cherished, and loved. Now to the fun part. A giveaway - win $20 gift certificate to spend in Altenew store!The giveaway is super simple: just leave a comment here on my blog until Sunday, October 27th at 11:59pm EDT and I'll draw a random winner on 28th October - the winner is announced here in my blog then. Remember to come back and see if you won. Next, head over to Agnieszka Malyszek blog and continue your crafty online journey. And do not forget to leave comment on Altenew blog too, as there's five 100$ product packs looking for new home. Thank you so much for taking time stopping here! Ps. Here's a little discount for you to use at Altenew store! Valid today and tomorrow. So beautiful! So bright and cheerful! Neat how you did the background, thanks for the idea. This is a beautifully designed layout. Great job. What a great look! I must try this. What a beautiful background for a lovely picture. Thanks for sharing. Such a pretty layout, amazing! Wow! your stamped and painted background looks awesome! Very creative, this is definitely a labor of love. I love how you chose to use red/pink in this layout...to me that have love all over it. This is amazing work. So beautiful. Thanks for sharing. This is amazing. Looks so complex. I love how free flowing this layout is....thank you so much for sharing your time and talent. Wow! What a beautiful layout! I love this crafting community and the fact that it can bring people together from all over the world. I have "met" some wonderful friends in places like Florida (USA) and even New Zealand! Wow this is super gorgeous! Love the colors and the design!! Such a soft and elegant layout! Very pretty! The paper weaving is exquisite. Beautiful page. Thank you for sharing! your pieced background is lovely - wonderful layout! Love your artsy pieced heart. Love those graphic dies - and your layout. Love the layout and colors! Love your imaginative and beautiful layout featured here! Clever layout and use of color. Wow this layout background was a big work! Congrats! It is amazing! Very striking! love the colors you chose. So pretty! I love all the pieces arranged and embellished like this! I will be scrap-lifting this at my nextcrop! Beautiful layout! I really like the piecing of the main background and all the layers behind the sweet friend image. Very pretty. Could adapt to card I think...at least be fun to try! Beautiful! love your blog too! Your layout is so pretty and creative!!! I love your festive, very pink layout! So pretty. Love your use of color! Beautiful and unique layout! I just love it! Thank you for the inspiration! This is a beautiful layout! I love how you created the heart and am so thankful you have wonderful crafty friends! Very pretty. Thanks for participating in the blog hop. I love the heart background! Wow! What a stunner! I LOVE how that background with those dies came together! Love this wonderful Lo Terhi! Very clever use of those geometric dies and paper collection! Love it, thanks for sharing! Your layout is beyond beautiful! The layout reminds me of tetris. It is very fun and colorful! Beautiful layout, love the pinks. This layout is truly beautiful !! Wow! I am not usually a lover of Pink but this layout is breathtaking! As they said in the 80’s , pretty in Pink”! Love what you have done! TFS! Gorgeous page, LOVE the pinks and reds in the heart, so much interest and texture! This is awesome. I'm surprised something g so graphic became so loose and organic looking. Sweet sweet layout. Love all the pinks and reds and shapes. Love the heart shaped layout done in reds. Thank you for sharing. Really cool layout. The heart shape is perfect. Wonderful layout! Love the heart shape! Beautiful layout! I love all of those pink pieces. Oh my goodness this page is beautiful. Lots of work. Did you weave the paper together for your backdrop? It's beautiful! This is a great blog hop! Oh wow, simply WOW! I absolutely love it! I would use this towards a paper kit! Gorgeous background (I had to to pin it for inspiration!) That must of taken some time! Thanks for sharing! Beautiful layout! Thanks for sharing. WOW! What a beautiful scrapbook page you created!! 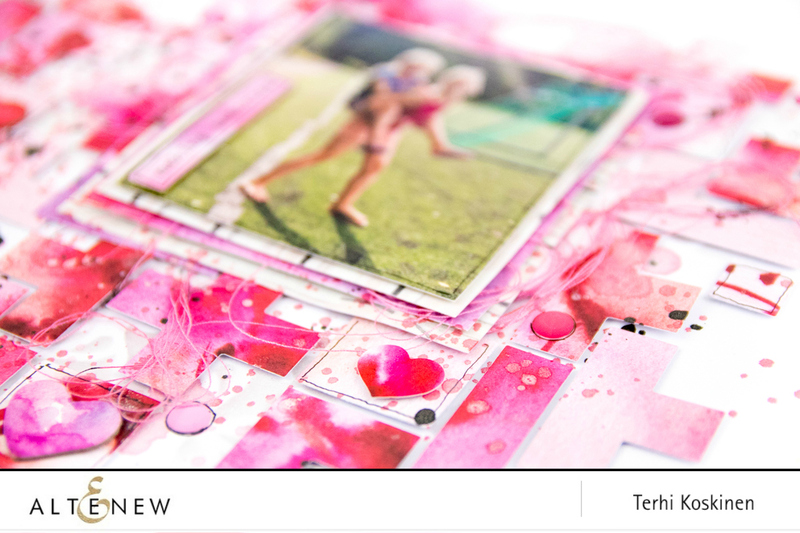 Love the pinks & reds Terhi, this is a great layout. Nothing is more fun than crafting with friends! Wow.. I think I just fell in love! What a wonderful background. Just love the colors, the sense of mosaic but all blended. Terrific. Love the pinks and reds. Lovely layout! Spectacular! Love the colors! Wow! Wow - this is just gorgeous! Nice job with the layout in pinks. I love that! And I agree: crafting creates friendships. There are so many out there that I consider my friends that I haven't met yet! Thank you for your very crafty and creative post. Very interesting design and pretty combination of colors. The photo just pops! What a beautifully designed layout. The colors are wonderful. This layout is exquisite. Thanks for sharing such an inspiring project. Oh my...what a gorgeous layout! Just love that heart and how it's made up of the different pieces. Very creative with the heart design. My favorite color is pink so I love this layout! love all the textures and dimension and the colors, oh the colors! Aren't crafty friends and crafty communities the best? Caring, sharing, teaching, learning, supporting, understanding...I could keep going but as a member of the community you understand exactly what I'm trying to say! Wow, I love that gorgeous pink background! An awesome layout! Upea leiska! 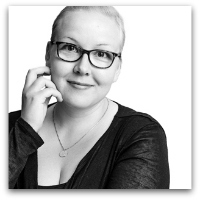 Olisin mielelläni lukenut enemmän siitä miten sen toteutit. I love how you used a collage style for your background to highlight the photo. You are extremely talented. Thanks for sharing. Awesome layout and stunning colouring!!! Love this gorgeous lay out! Great cause to hop along! Simply Breathtaking!! I love this layout! This layout is a work of art! Amazing use of the dies! Love how you made the heart. What a cool layout! Love the colors and heart shape! Great layout and love the colours very inspirational Thankyou for sharing. I love the layout of your project. It's soo happy, colourful, warm; it brings a smile to my face. So pretty, love how it still feels so soft, even though you issued geometric shapes. My gosh that looks like a lot of work - but so gorgeous. Definitely worth it. Ooo . . . this layout is gorgeous!! Love the pinks and reds and the heart shape is really fun! Very beautiful layout and colorful! FAbulous subtle Heart shape in your layout! My daughters and I are putting together a photo album for my mother. This will definitely be useful to help us with the designing. What a beautiful layout. Love the bright colors. What a sweet layout! Love the soft heart design. Thanks for sharing. Love that gorgeous heart design! Beautiful page! The colors are great. TFS your beautiful layout! What a beautiful layout! I love the graphic look of the heart and the colors are wonderful! Thanks for the inspiration! Love the colors and the look. So pretty great job! Wow, what a stunning page and such lovely words. Yes, crafty friends all over the world are the best! Like the colors & design! Stunning layout,i felt all that love looking at the layout!!! You created such a gorgeous background! Beautiful layout! I love how you created the background heart. What a cool background. I like your color choices as well. Beautiful layout! Love all the different pinks. Love the amazing colorful background. Very beautiful. Love your beautiful, creative layout. Beautiful layout. Love the colors. What a beautiful background you've created! WOW! That layout is just OUTSTANDING! It is just stunning and I would love to scraplift it! You are very talented! Thanks for sharing! Love love love!! It's beautiful!! Wonderful layout...love this creative heart.